Food Costs > How Much Does Yogurt Cost? How Much Does Yogurt Cost? On average, the cost of yogurt will depend on the type of yogurt, the brand, where you purchase it and the quantity. Every cup, regardless of these factors, should be $0.30 to $3 per cup. At Walmart, for instance, the various six-ounce containers from popular brands retailed for $0.30 to $0.75, whereas a 32-ounce container retailed for closer to $3 to $5, depending on the brand. The traditional type of yogurt is the kind that can be found in the dairy section of your grocery store. This type of yogurt is the most common and is what most people think of when you mention yogurt. There are many different flavors such as strawberry, cherry, blueberry, lemon, and there are also dessert flavors such as key lime pie, raspberry cheesecake, Boston creme pie, and many others. Some varieties also have actual pieces of fruit. A dairy alternative yogurt, designed for those who are avoiding dairy, will use alternative ingredients such as coconut, chia seeds, pureed tofu or soy milk. Another popular form of yogurt is frozen yogurt. While ice cream can be a delicious treat, especially in the summer months, it is also quite high in fat and calories. Frozen yogurt, just as the name implies, is yogurt that has been frozen and made into the texture of ice cream. This can be used to make all the different ice cream treats, such as ice cream cones, sundaes, and flurries. Another type of yogurt is Greek yogurt. The main difference between regular yogurt and Greek yogurt is that Greek yogurt is strained an extra time, which gets rid of more whey and makes the yogurt much thicker. Icelandic yogurt, similar to a Greek yogurt, is high in protein and adds a bit of a tang, according to the Huffington Post. Besides it being thicker and slightly higher in protein, Icelandic yogurt will only be made from a non-fat milk, while Greek yogurt will be made from full fat. Kids yogurt, which, of course, is targeted toward kids, will most of the time, be organic and healthy, but this isn’t always the case as there are some brands packed with a lot of sugar, preservatives and filler ingredients. MarryAnnJacobsen.com, for instance, created a list of the best yogurts to consider for your kids. The main difference will be in the flavors, which can include fun flavors such as strawberry-banana or vanilla with cookies. Light yogurt, often targeted toward those who diet, will have fewer calories and sugar and are often packed with artificial ingredients and/or sweeteners. Organic yogurt will be made without any additives or stabilizers, making it a 100 percent natural choice. Depending on the company’s ethics, some may cook its yogurt inside a stainless steel container instead of a plastic cup. A traditional probiotic yogurt, according to Dr. Axe, is made from the dairy that’s fermented into a creamy food that’s packed with probiotics and is considered to be a balanced source of fats, carbohydrates, vitamins, minerals and proteins. Yogurt typically comes as a solo cup with an aluminum-style peeled back lid, but there are also common packs of two and fours, depending on the brand, and larger 16- and 32-ounce containers. 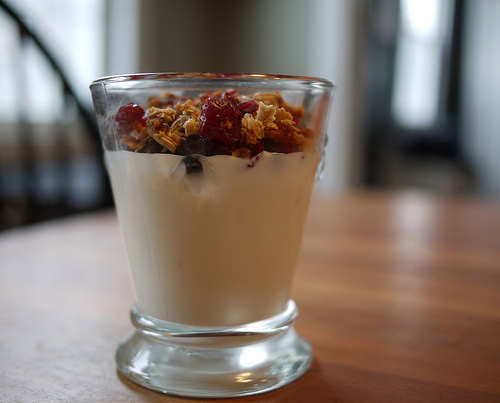 Some higher end yogurts come with add-ons attached such as granola or chocolate chips attached to a separate portion on top of the lid. Top yogurt brands include Yoplait, Fage, Chobani, Stonyfield, Dannon and Noosa. Always read the ingredients on the back of every yogurt product. Some may have more calories than expected or even ingredients you did not know existed such as high fructose corn syrup or even a high amount of sugar. Store-branded yogurt, such as Walmart’s Great Value or Kroger’s Simple Truth, are almost the same as expensive yogurts but can be found for 30 percent less. If you do not mind store brands, give your local store brand yogurt a shot. Try to buy yogurts in bulk at your local wholesale clubs such as Sam’s Club or Costco. You could save at least 20 percent; however, make sure that you use it before the expiration date listed on the package. Yogurt brands almost always have coupons in the local newspaper or online via social media.